I’m a big believer in dressing up for no reason – especially when you’ve had a rough couple of days and need that extra little something to perk you up. For me, there is no better way to do this than with sequins. I love the idea of dressing down your fanciest top by layering a casual basic underneath & adding distressed denim for an effortless ladylike look. Give it a try – it’s an instant mood lifter! That sequin top is phenomenal!! Love it!! You are very classy. I appreciate that. I'm loving this mix of dressy with casual. Those earrings are gorgeous. I love them! you look beautiful as always! 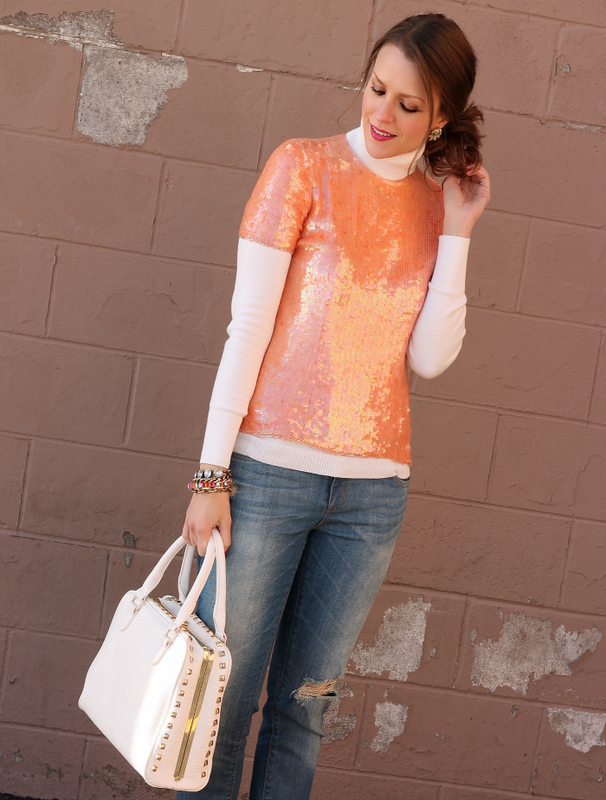 love the sequins and that bag…can't believe it's f21! I like your bag and earrings very much! This look is beautiful on you. I love the casual feel of the jeans and the added element of surprise… sequins. I would have loved to see your hair from a different angle. It looks BEAUTIFUL!! I was just about to break out my sequins this week! I like the idea of pairing the sequins with distressed denim. I'll have to try that! I'm so glad I'm not the only one who thinks dressing up for fun is awesome! I love wearing sequins after the holidays. That top is so pretty and it looks fantastic layered over the turtleneck. You always have flawless skin too. What foundation do you use? I really like this! I hate turtlenecks, and I hate them under anything. You make this look snuggly, sparkly, and fancy. I love it, particularly the shoes and bag! love this so much! one of my favorites because it's so wearable during the day. your photos are gorgeous, and your pop of color on your lip is perfect. as always! Love this times a million! The color of that sequin shirt is amazing. Seems like you always see sequin tops in black and white. I'm also a big fan of layering with turtlenecks. It's a winter life-saver! I totally agree! Sometimes it takes something special to pull you out of a funk. 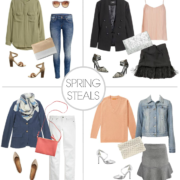 I love the idea of mixing dressy and casual items. Well done! Love this bag!I need to get myself to F21 pronto. I will totally wear sequins during the day. I think it's pretty much a normal thing to do now! Cute look! I'm a huge fan of day time sequins – great example of how to do it right! I love dressing down glitsy pieces to make them more versatile. The peachy color of your blouse is so unique! Love it! I LOVE buying vintage sequins on Etsy! What store did you get the top from? I have a few fav. vintage stores on Etsy but I'm always looking for more! OMG this is such a great look. I love how you really made a casual look very classy. LOVE that sequin top on you! Day sequins are my favorite!!! I love sequins all the time and those bf jeans are the perfect way to tone them down. Great look! I'm not really a fan of sequins but you made me change my mind! Amazing! I love a great daytime sequins look! I'm really in LOVE with this outfit! I couldn't agree with you more about dressing up for no reason. Daytime sparkles always make me smile. I love that F21 bag – it looks like a designer bag, so pretty paired w/ the sparkly peach! LOve the sequins! its a fun pop of color too, love your style! I totally agree with you on this one! I always feel extra special when wearing sequins during the day. You managed to dress yours down perfectly, you look stunning! Sequins in the day is so pretty. I love the color of this top – it so bright & cheery! You are looking fab as always! I haven't layered a top over a turtleneck since the fourth grade! I have no words to describe how much I LOVE this look, Kimberly. I have been wanting a sequien top similar to this! Als I am super jealous you live in new york! I love wearing sequins causally, and this is perfect…love the bracelets too! LOVE daytime sequins! This vintage top is so gorgeous, like mermaid scales, but in a fabulous way! I saw a really nice sequinned top from Dress the Population lately but I was a little unsure how I would style it outside of parties. Great idea! This is such a gorgeous look! That sequined top is amazing and I love how you dressed it down for a laid back but stunning look.